Soaking in a hot bath, like Rane’s RM3 Superior personal spa, provides health benefits for people who are unable to exercise regularly. A study (at Longsborough University) found a link between hot baths, blood sugar, and calories burned. Both, the calories burned and Type 2 diabetes were reduced when associated with taking a bath and its heat stress response. Passive heating is a means of raising your body temperature through a method such as soaking in our Rane RM3 Superior personal spa. Passive heating raises the level of your heat shock proteins, which act as intra-cellular chaperones to other proteins and protect cells against stress. These heat shock proteins assist in moving more sugar into your skeletal muscles and improve glycemic control. In the study, participants spent either one hour soaking in a hot bath (passive heating) or one hour cycling (active heating). While cycling did burn more calories, the hot bath still burned around 140 calories or the equivalent of a brisk 30 minute walk. Furthermore, the study found that during the subsequent meals, the blood sugar levels of the participants were lowered by 10%. The RM3 Superior personal spa from Rane Bathing & Accessibility can provide health benefits through core body heat up for those who are unable to exercise regularly. With a swing out door for simple transfers providing safer entry and exit, it is a smart option for any individual including those with progressive mobility issues. The RM3 Superior’s unique contoured door is designed to clear the toilet, making it perfect for smaller spaces. As an added option, bathers can melt stress, aches, and pains with the millions of heated air bubbles injected from an Air Spa or the therapeutic whirlpool system. Other features include a handheld shower wand for rinsing off after a bath and a secondary door lock for safety. 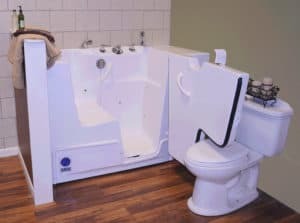 Made in the United States from premium quality materials, the RM3 Superior personal spa from Rane Bathing & Accessibility can provide wellness benefits including the burning of calories and lowering of blood sugar similar to exercise, yet in a relaxing personal environment which might include a good book. Just another reason to enjoy a good Rane! https://ranetubs.com/wp-content/uploads/2019/01/RM3-Superior.jpg 223 300 Rane Tubs https://ranetubs.com/wp-content/uploads/2018/12/Rane-Logo.png Rane Tubs2019-01-09 17:39:262019-01-09 21:57:36No Time to Exercise? Introducing the Redesigned RK12 Winnipeg The RS8 Geneva just got even better!